We love Rosie Fortescue’s sparkling Nikki Lissoni set regularly featured on her style blog. The sparkling cubic zirconia carriers will bring extra glam to your look. 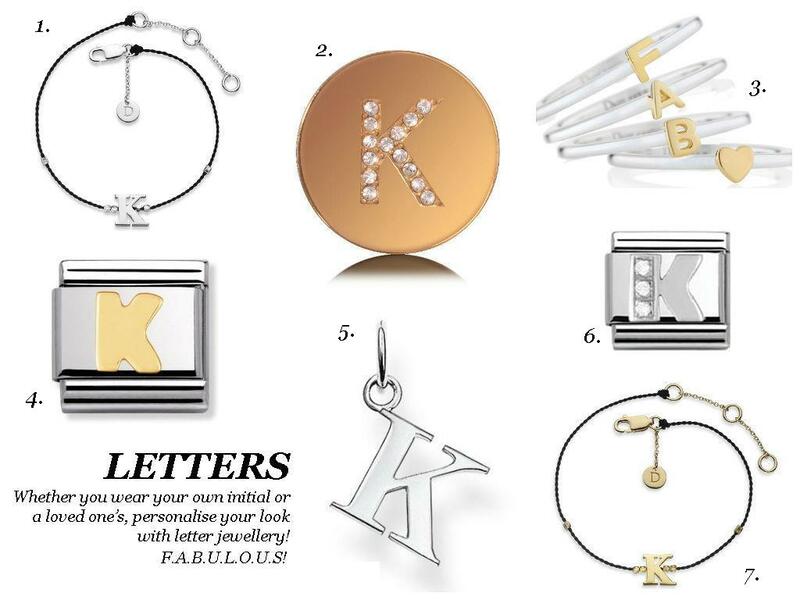 Rock the letter trend with your own initial like Rosie, or wear the initial of someone you love for a meaningful and personal accessory. Fearne Cotton was spotted rocking her Nikki necklace at Radio 1’s Big Weekend in Glasgow. 1. 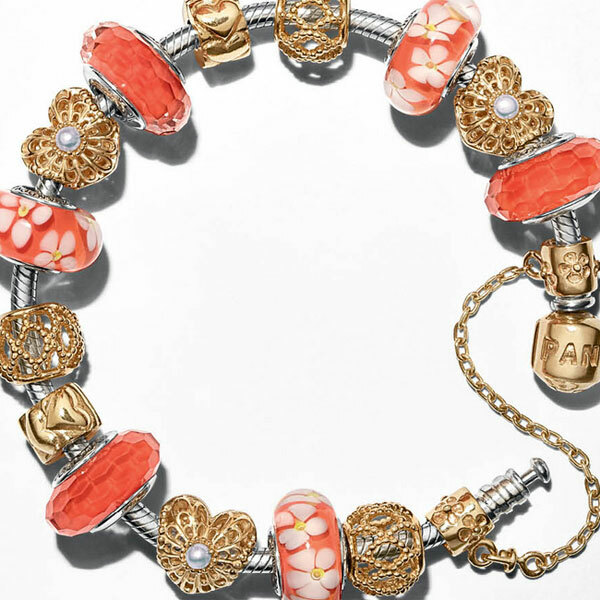 Choose an interchangeable jewellery collection like Nikki Lissoni. I took my two chains, two carriers and two coins which gave me several different looks from day to night. Top Tip: Buy the 90cm chain length, I double mine up creating a layered chain which looks great around a shirt collar. 2. Airbnb is the greatest invention for independant travellers and one of my personal favourite websites. We rented an amazing apartment in the Gothic quarter with three balconies, a lounge-diner, kitchen, great bathroom and big bedroom in a secure and beautiful building for half the price of a nice hotel. Airbnb is great as you’ll be staying in residential areas, giving you a real feel for the city, plus, the owner of the apartment will be able to give you top tips on where the locals eat and drink! 3. Barcelona in May is beautifully warm in the sunshine but definitely gets chilly in the shade and evenings, I’d suggest a long-line blazer, perfect for travelling in and goes with everything. Role the sleeves up for a laid-back luxe feel. 4. When baggage restrictions are tight don’t be tempted to take lots of shoes, you won’t wear them. Instead, invest in some smart quality sandals which you can wear day and night. I’ve finally realised that I don’t wear heels on holiday, so I don’t waste space in my bag taking them just to look at them for four days! 5. The only problem with taking hand luggage on a flight is the liquid allowance. Products can’t be over 100ml and they now have to fit in to a zip up plastic bag which luckily were available at security, (£1 for four in Birmingham) so firstly, double check your flight company and airport for their regulations. Secondly don’t be fooled with ‘travel size’ containers, I have been before, buying all of my products in small ‘travel’ sizes and decanting perfume into an atomiser only to find the majority were already under 100ml! Superdrug had great travel products for £3 for three, where as Boots were a lot more expensive – don’t forget, you’ll be able to buy all of these things abroad too! 1. Walk. I was in training for the fab50k in Barcelona so rather than use public transport we walked everywhere. Yes it helps the waist line, but more importantly you get to see everything! I love taking in all of the beautiful buildings in European cities and there’s no better way to do that than on foot. 2. Eating and Drinking is cheap in Barcelona as long as you keep your whits about you. Las Ramblas, and Placa Real will be very expensive to eat and drink on, instead head a couple of streets off the beaten track and find the quieter areas. Here you can get a beautiful chilled glass of Cava for 3 euros, ask for ‘caña de cerveza’ (draft lager) which is as little as 1.50 euros. Tapas is the way to go and the portions aren’t small, so four or five dishes will happily feed two for very little money. 3. Book in advance. It’s so easy to book on-line now, Sagrada Familia can be booked in advance which gets you a queue jump and saves you standing in line for hours in the mid day sun. 4. Take time to chill. 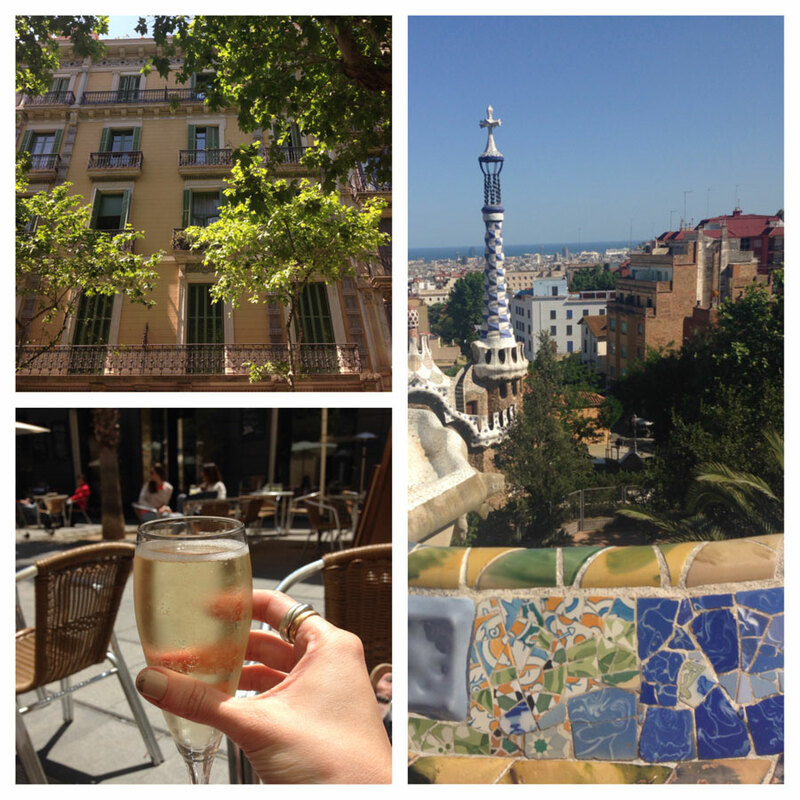 It’s great to see lots of sites but watching the world go by over a cold glass of Sangria in Parc Guell was one of my highlights, as well as a couple of hours on the beach. Don’t fill your days too full or you’ll come back in need of a break! 5. Flamenco at Espai Barroc. I love Flamenco and watching it live in a stunning gothic building was breathtaking. I’d highly recommend going, it’s 20 euros with a free (large!) drink and was the best 20 euros I spent on the trip! 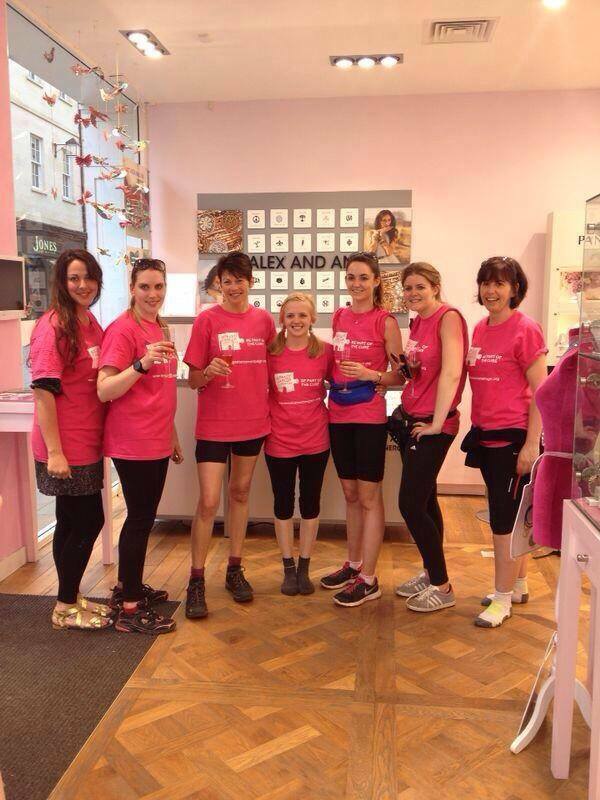 On Friday 23rd May seven members of staff from the Leamington Spa and Solihull stores along with owner, Jo Stroud and the web team undertook the fabulous 50k! The Leamington Spa, Solihull and Web Team at the finish line! Setting off from our Leamington Spa store at 8.30am we started our walk along the Grand Union canal, walking from Leamington Spa past Hatton on to Solihull (32k). After a short lunch break at Solihull we took to the roads to walk the remaining 18k back towards Leamington Spa finishing at The Falcon near Hatton. For the last 15k of the walk the rain came, dampening our clothes but not out spirits, it was a gruelling challenge which we all finished by 6.30pm, a total of 10 hours walking with a couple of short breaks. On the 16th May our Bath team (joined by a couple of members of the Solihull team) did the same distance between Bath and Bristol. 50k in glorious sunshine (the hottest day of the year so far) taking in the River Avon trail and finishing up back in store 11 hours later. This challenging route made for a longer journey, with an injury or two along the way, the team really had to dig deep to finish the challenge. The Bath and Solihull team at the finish line! So congratulations to Becky, Jess, Vic, Anna, Luci, Gaia, Jo (who did both of the walks! 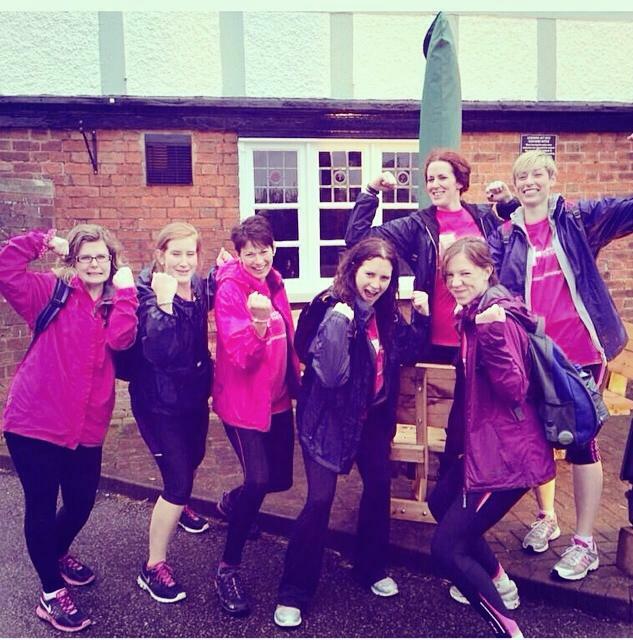 ), Laura, Amie, Dani, Rhian, Sinade and Anna who completed the challenge, well done team fabulous for raising over £1800 for Breast Cancer Campaign, if you’d like to donate to this fabulous cause you can at our just giving page. Spot a Genuine Thomas Sabo Retailer – Infographic! We’ve put together this Thomas Sabo infographic with information on spotting a genuine Thomas Sabo retailer and other handy hints! 1. 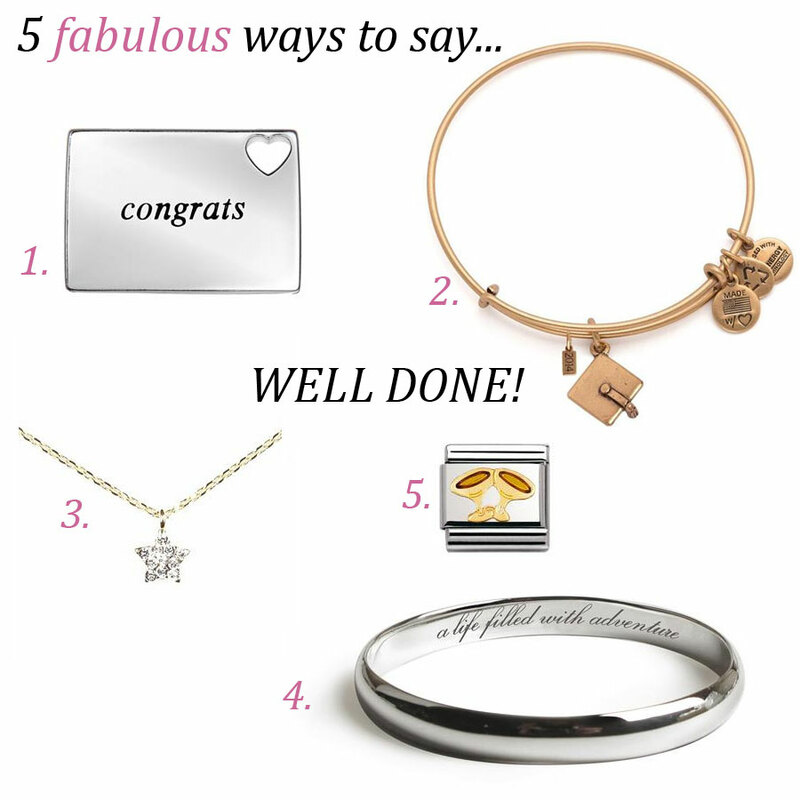 Lily and Lotty ‘Congrats’ necklace, £42. We love this cute love letter design with slim silver chain and real Diamond accent. It’s a great keepsake to remind them of their achievement. 2. Alex and Ani Graduation Bangle 2014, £24. Each year Alex and Ani release a Graduation bangle to mark the occasion, we love the hanging 2014 charm to stamp the year they finished. 3. You’re a Star necklace from Estella Bartlett, £14. A cute hanging sparkling star necklace to let them know how proud of them you are. 4. Tales from the Earth adventure bangle, £45. So they’ve finished their degree what now? We love this Silver bangle engraved with ‘a life filled with adventure’ it’s the perfect sentiment for their future. 5. Nomination Champagne Toast link, £20. The perfect addition to their Nomination bracelet, this chic link will remind them of their years of hard work and how proud of them you are. On Friday 9th May we hosted our first ‘reloved’ event. In the Pavilion on Stall street we set up our reloved workshop for passers by to come in and hear about our exciting up-cycling initiative for Breast Cancer Campaign. We have started a jewellery amnesty, where anyone can bring in old or unwanted jewellery to a fabulous store and we’ll say thank you by giving you a 15% discount voucher. We then take the old jewellery and give it to students at City of Bath College and Coventry University who will upcycle the jewellery in to new exciting creations. These new items of jewellery will be sold online www.fabulouscollections.co.uk/reloved where you make a suggested donation on our just giving page which goes directly to Breast Cancer Campaign. Our workshop on Friday was to create our ‘Reloved’ logo for future events, we invited people in to our crafty tent to decorate our logo with old pieces of jewellery and beads. We had such a great day and were thrilled with the amount of people who came along and supported the cause, not to mention our fabulous new reloved logo! Our new reloved logo, lovingly made by the people of Bath!